Keighley and Worth Valley Railway01535 645214work Group VisitsThe steep gradient up the Worth Valley from the Keighley terminus has been a challenge for locomotives ever since the line opened on 15th April 1867. The sound of a steam engine tackling this climb echoes from the steep sides of the valley, while great clouds of steam and smoke add drama to the scene. Many of the woollen mills that once stood close to the line have been demolished, but a few remain as reminders that the textile industry was the reason why the line was built. Like the railway, the mills relied on coal, and the trains were able to bring hundreds of tons up the valley each week to keep the looms working by steam power. The five mile journey is a powerful reminder of our industrial heritage, as well as being a unique way of enjoying the beautiful countryside immortalised by Charlotte, Emily and Anne Brontë. When British Railways closed the line in 1962, local people and railway enthusiasts joined forces to try and save it. A Preservation Society was formed and after many years of volunteer struggle the line re-opened to passenger traffic on 29th June 1968. The decision to recreate the atmosphere of a 1950s branch line has been hugely popular, not least with film makers and TV producers. Over the years, the Railway has appeared in many TV and film productions including Yanks, Sherlock Holmes, Last of the Summer Wine, Treasure Hunt, Sons and Lovers, Some Mothers Do 'Ave 'Em, Poirot, Born and Bred, The Royal, Where The Heart Is, A Touch Of Frost, Songs Of Praise, and Pink Floyd's The Wall. 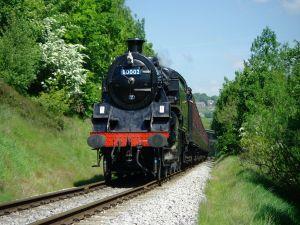 The railway has many events througout the year, ideal for a family day out. The Railway is perhaps most famous for its role in the 1970 film version of Edith Nesbit's story The Railway Children To learn more about the making of this classic film, including details of the locations used, pictures showing the film being made, details of the locomotives and coaches used, memories of those involved, and much more. Various times throughout the day. See website for timetable. Family Day Rover: £35. This ticket is the same as the Day Rover, although is ideal for Families and Small Groups travelling together. Valid for 2 Adults and up to 3 Children or Concessions. (eg - 2 adults + 1 child + 1 OAP). Offers a saving of up to £25 on individual tickets! Concession fares, Student Rates & Local resident reductions available.